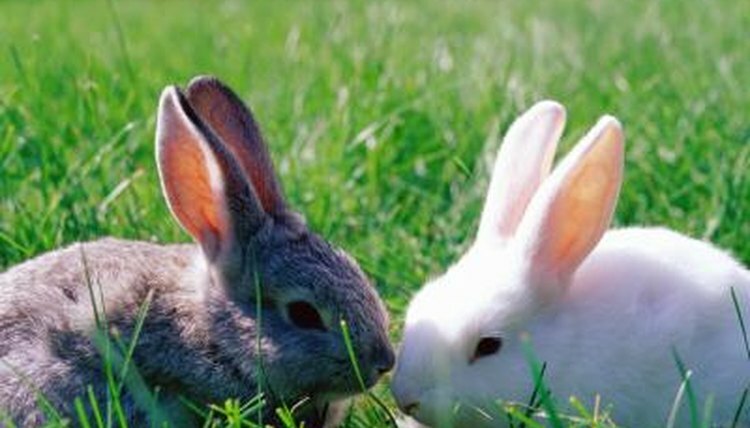 Breeding season for rabbits begins in February and continues through late summer. Rabbits produce several litters per year: Dwarf rabbits give birth to two kits, average-size rabbits six kits, and larger breeds produce about 10 kits per litter. The kits require considerable attention from their mother during the first two weeks, with nursing and grooming as top priority. At the age of 5 weeks, kits are capable of feeding on vegetation alongside their mother. The silver fox rabbit is a large breed, weighing 9 to 12 pounds at maturity. This is an American rabbit breed originally created for meat and fur. Silver fox rabbits now commonly serve as show rabbits. Does are considered to be excellent mothers and produce good-sized litters. Kits are born solid blue or black, taking about four months to develop their silver coat coloring. Checkered giant rabbits are also known as giant papillons. They originate in Germany. They are white with black spots and markings. Adults weigh 13 to 14 pounds at maturity. Checkered giants are known to breed at older ages than other rabbit species due to their delayed sexual maturity. They start mating at 12 to 18 months, producing litters of 11 to 14 kits. Life span for captive checkered giants is about 8 years. Giant angora rabbits date back to 1720s Turkey. They are now at home in countries throughout Europe and Asia. They commonly serve the angora wool trade. Adults weigh more than 10 pounds. They grow slowly, reaching maturity more than a year after their birth, at times taking more than a year to reach adult weight and size. Giant Angora rabbits produce six or more kits per litter, mating several times a year. The life span is about four years. New Zealand white rabbits were developed in 1916 with the purpose of fur trade and meat production. Today, they are mostly bred for their meat and are used as scientific experimental test subjects. They are frequently chosen as house pets. Adults reach up to 12 pounds. Females are fertile year-round; they have gestation periods of 28 to 35 days, usually giving birth around day 32. They mate several times a year and produce large litters of about 10 kits. A doe can get pregnant 72 hours after giving birth.